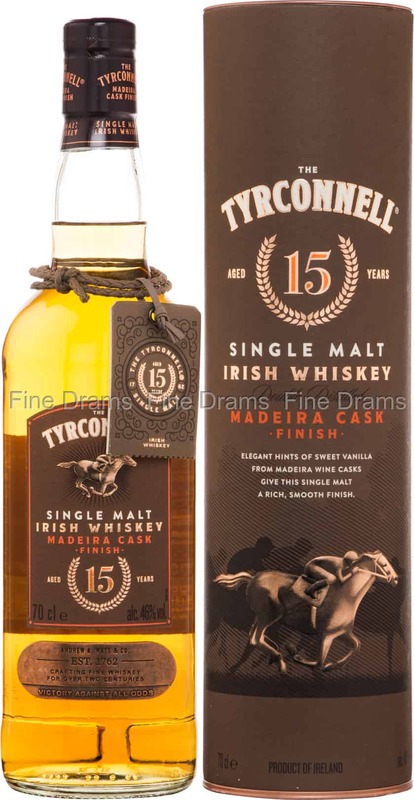 A delightful cask finished Irish single malt from Tyrconnell. Tyrconnell is named after a racehorse that ran National Produce Stakes Horse Race at odds of 100-1 only to win! This whiskey, produced at Cooley distillery, was aged for 15 years in former Bourbon casks, before being finished in former Madeira wine casks. The result is a fruity, delicious Irish dram, packed with notes of sweet grapes, vanilla, apples, pears, warm malt, caramel, wine tannins, oak spice, bananas and dried fruits. Bottled at 46% ABV, the whiskey enjoys a thick, creamy mouthfeel.